Imagine if you had never before ridden a bicycle, snapped a photo, or worn a pair of jeans. These experiences, so much a part of daily life today, were once technological novelties. While the original versions may look peculiar compared to their modern-day descendants, they provide fascinating early glimpses of innovations that influenced how Americans lived, worked, and played. 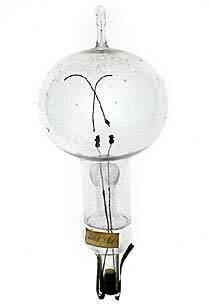 Thomas Edison used this carbon-filament bulb in the first public demonstration of his most famous invention, the first practical electric incandescent lamp, which took place at his Menlo Park, New Jersey, laboratory on New Year’s Eve, 1879. As the quintessential American inventor-hero, Edison personified the ideal of the hardworking self-made man. He received a record 1,093 patents and became a skilled entrepreneur. Though occasionally unsuccessful, Edison and his team developed many practical devices in his “invention factory,” and fostered faith in technological progress. 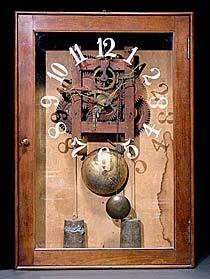 Before Eli Terry invented this simple shelf clock, only the wealthy could afford to have a timepiece in their homes. In his Connecticut factory, Terry mass-produced clocks from interchangeable wooden parts, a technique known as the “American system.” Machine-made clocks added to the abundance of cheap consumer goods generated during the Industrial Revolution, and soon they became a staple of the average American household. Even those who did not know how to tell time bought clocks as decorative objects for their mantels. 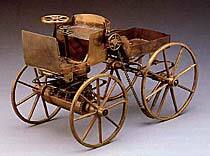 George B. Selden based his claim to be the “father of the automobile” on this conceptual model of a combustion-engine vehicle, which he designed in 1879 and patented in 1895. No individual can be credited exclusively with inventing the automobile; its design and production were shaped by many different innovations. But for fifteen years, the U.S. courts upheld Selden’s claim to be the first, and other automobile manufacturers paid for the rights to use his “invention.” In 1911, a lawsuit brought by Henry Ford invalidated Selden’s claim. One of the oldest surviving ancestors of the modern bicycle, this wooden two-wheeler is named for its German inventor, Baron Karl von Drais. 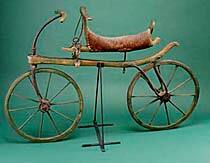 Also known as a velocipede or hobbyhorse, the draisine enjoyed brief popularity in Europe and the United States during the 1810s and 1820s. To propel the machine, riders pushed along the ground with their feet. In 1863 a new invention, the pedal, helped transform the bicycle into a more practical and widespread mode of transportation. 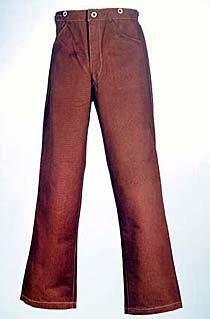 Though made of brown duck rather than blue denim, these “Levi’s”—one of the oldest known pairs—feature the familiar riveted pockets, button fly, and waistband patch of modern jeans. In 1873, San Francisco merchant Levi Strauss and tailor Jacob Davis patented a design for workers’ trousers reinforced by copper rivets. Strauss manufactured the pants from cheap, sturdy fabrics, including a cotton material called “jean.” Initially worn by miners and cowboys, jeans evolved into casual clothing for all ages, classes, and lifestyles. 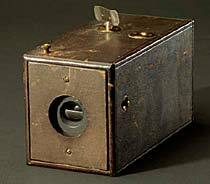 This original Kodak camera, introduced by George Eastman, placed the power of photography in the hands of anyone who could press a button. Unlike earlier cameras that used a glass-plate negative for each exposure, the Kodak came preloaded with a 100-exposure roll of flexible film. After finishing the roll, the consumer mailed the camera back to the factory to have the prints made. In capturing everyday moments and memories, the Kodak’s distinctive circular snapshots defined a new style of photography—informal, personal, and fun.